Morning lovely people... I hope you're all well and gearing up for the New Year. For those of you who read my previous post you'll be aware that I had more Soap and Glory goodies on their way, courtesy of my brother. Well, I picked them up yesterday so I'm excited to give you a little sneak peek at them. When my brother asked me what I wanted for Christmas this year I gave him strict instructions to trawl the Boots online sale for some Soap and Glory goodies for me and he came up trumps. 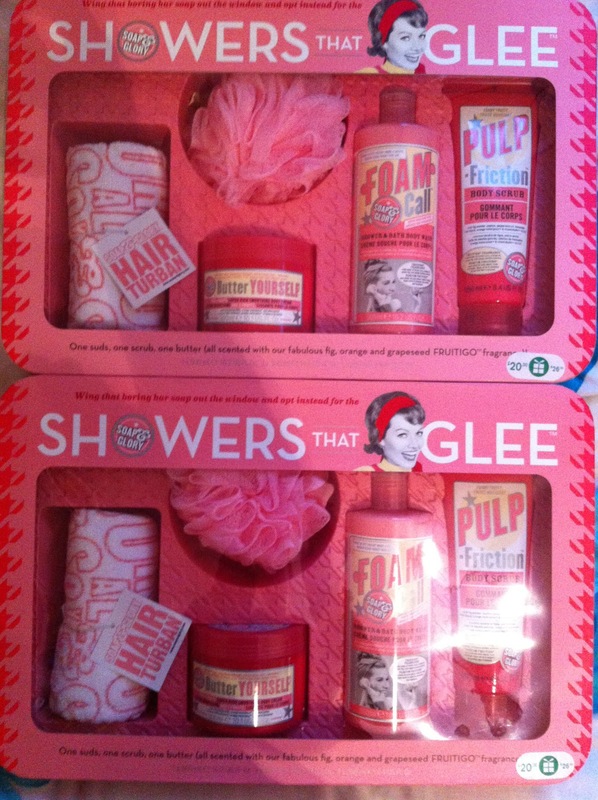 He managed to pick me up two of the Showers that Glee gift sets which contain the entire Fruitigo range. Ever since receiving Pulp Friction last year, I've been hooked on the scent. It smells fruity (shocker) and in my mind is a really great beach holiday scent. To quote the blurb, they say it has 'notes of frozen yuzu, orange oil, green fig and jungle pomelo essence'. I'm going to be 100% honest with you, apart from the orange oil, I'm not entirely sure what the rest of those things are so if you know, drop me a comment. All I'll say is that it smells lovely. The gift sets contained Pulp Friction, Butter Yourself and Foam Call so it covers all bases. They even threw in a little shower puff and hair turban too which are nice extras. As you can tell I am really pleased with my gifts and I 100% recommend the Fruitigo range as a whole, although if you can get hold of the gift sets in your local Boots I definitely would ( saves lots of pennies). Full reviews to follow! I can't wait to try Butter Yourself and Foam Call! If you've tried them, drop me a comment and let me know what you think!